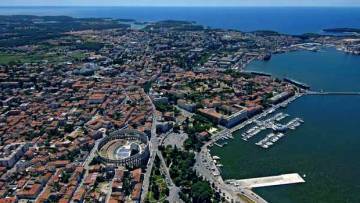 PULA is the largest city in Istria with a population of more than 80,000. The three-thousand-year-old city lying on the south cape of the Istrian peninsula is the place where the old meets the new in a union inspiring numerous writers and composers to create their works of art. A lot of cultural and historical monuments provide the setting for the cultural and entertainment events of the city. Of particular importance is the Roman Amphitheatre (Arena) which today provides the site for film festivals, and opera and concert performances. The tremendous Coliseum was built during the rule of the emperor Augustus, and the extension to the present size (133mx105m) was carried out under the rule of the emperor Vespasian (69-79). The amphitheatre may seat 23,000 people. Another famous sight is the cathedral built on the site of the temple of Jupiter and its early Christian basilica. There is also the Temple of Diana which used to stand parallel to the Temple of Augustus. The Golden Gate (Porta Aurea) was built as the triumphal arch for the Sergius family as early as 2,000 years ago. The Hercules' Gate was built as part of the Roman town fortification. There is also the Porta Gemina (Twin Gate) built in about 150 AD, then a castle built on the site of the Roman Capitol in 1630 by the Venetians and many other buildings. Tourist facilities are situated outside the city, in the thick woodlands along the coast. The apartment complexes of Punta Verudela and Horizont, followed by the hotels Histria, Palma, Park, Brioni, Splendid and Riviera resemble a Mediterranean town in miniature. The beaches stretch along the 190 km long coastline.